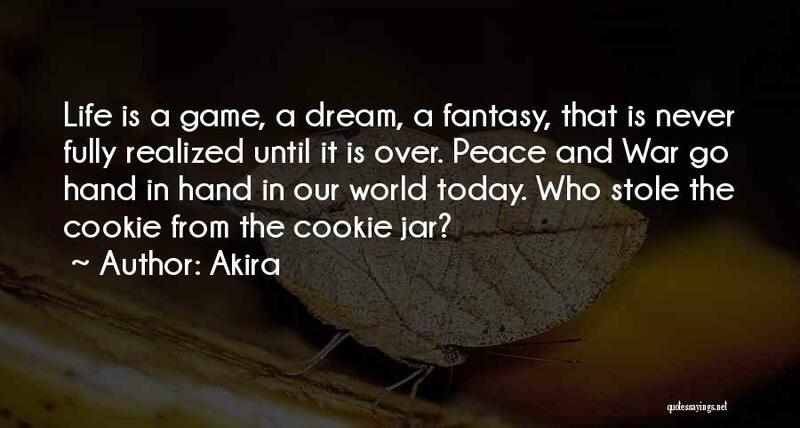 Enjoy the top 1 famous quotes, sayings and quotations by Akira. Life is a game, a dream, a fantasy, that is never fully realized until it is over. Peace and War go hand in hand in our world today. Ere you lie down to sleep in the night, sit still awhile, and nurse again to life your gentler self. Forget the restless, noisy spirit of the day, and encourage to speech the soft voices within you that timidly whisper of the peace of the quiet night; and occasionally look out at the quiet stars. The night will soothe you like a tender mother, folding you against her soft bosom, and hiding you from the harm of the world."